Satoshi create sounds in Tokyo.he called his style “Deep Tech House”. He collaborated many great artists.Todd Terry,Kaito aka Hiroshi Watanabe,Funk D' Void more. and more.) 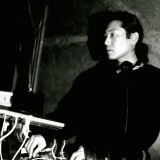 He run a label Sequent:Recordings and Outerspace Records(with Osamu M).